Rhett LaPorte and Spirit. Since seeing an SRC educational program presented to his sixth-grade class in his hometown of Birmingham, LaPorte says he knew what he wanted to do – join the SRC team. For many, choosing a career path can take years of trying on many different hats before one finds just the right fit. 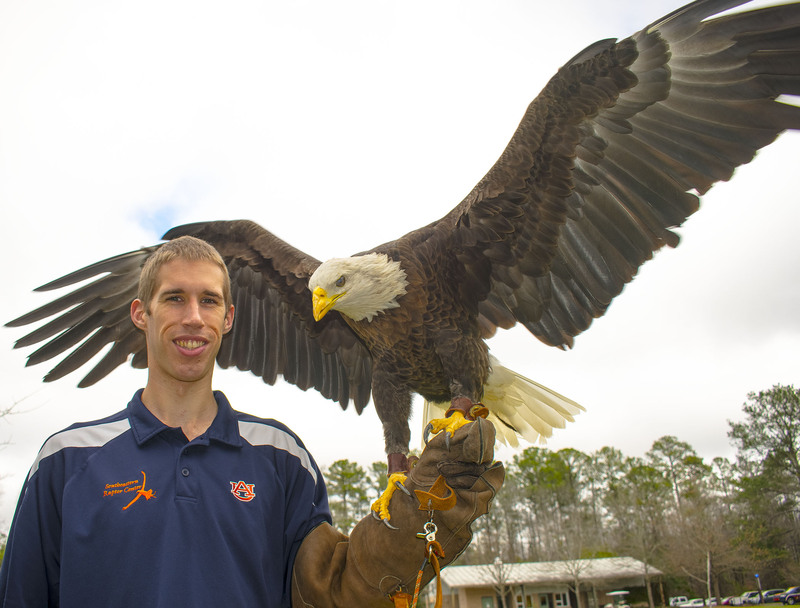 That’s not so for Rhett LaPorte, the newest staff member with the College of Veterinary Medicine’s Southeastern Raptor Center. Since seeing an SRC educational program presented to his sixth-grade class in his hometown of Birmingham, LaPorte says he knew what he wanted to do – join the SRC team. LaPorte says he was captivated by the birds from the moment that Marianne Hudson, assistant director of Education and Raptor Training, came to his middle school with a raptor program more than a decade ago. “I was fascinated, and I knew then that I wanted to do something with animals,” he said. LaPorte graduated in 2015 with a degree in Wildlife Management and Ecology. As a raptor specialist, LaPorte is a trainer and has responsibilities helping volunteers learn to properly train and care for the raptors. He also conducts educational programs throughout the state and at the SRC for special tours and events. “We are best known for the eagles and their free-flights at home football games,” LaPorte said. LaPorte said that some 300 training flights are conducted every year with each eagle before the first game of the season. “The eagles are well trained and have gotten a lot of exposure to performing in front of crowds before they ever take that first real pre-game flight,” LaPorte said.